I was a waitress at Applebee’s restaurant in Saint Louis. I was fired Wednesday for posting a picture on Reddit.com of a note a customer left on a bill. I posted it on the web as a light-hearted joke. This didn’t even happen at my table. The note was left for another server, who allowed me to take a picture of it at the end of the night. The scribbler got embarrassed that the note was made public and called Applebee’s restaurant demanding that all staff be fired. Obviously this person who wrote this note wanted it seen by someone. Now that the audience has gotten wider than just the server, this person is ashamed. The customer has been identified by numerous reports as a white woman, who is a self-described minister of her own church of 20 Christians. Is she ashamed of tithing? Or is she ashamed about not being portrayed as a charitable enough pastor? Or is it both? Equally baffling is the issue of the religious tithe itself. How is it in any way related to paying for services at a restaurant, of which gratuity is a part of, in the USA? Wait staff in the USA make only $3.50 an hour. As of July 2009, the federal government of the US mandates a nationwide minimum wage level of $7.25 per hour, although some states and municipalities can set minimum wage levels higher than the federal level, with the highest state minimum wage being $9.32 per hour in Washington as of January 1, 2014. Hence, most waiters’ paychecks are less than pocket change because they have to pay taxes on tips as well. After sharing any tips with hosts, bussers, and bartenders, waiters make less than $9 an hour on average, before taxes. They are expected to skip bathroom breaks if it is busy. They go hungry all day if they have several busy tables to work. At Applebee’s, they are also expected to work until 1:30am and then come in again at 10:30am to open the restaurant. Many of them work 12-hour double shifts without a chance to even sit down. They are expected to portray a canned personality that is at the least congenial for customers to return and least offensive to the greatest amount of people. Waiters are expected to do all of this, every day, and receive change, or even nothing, in return. 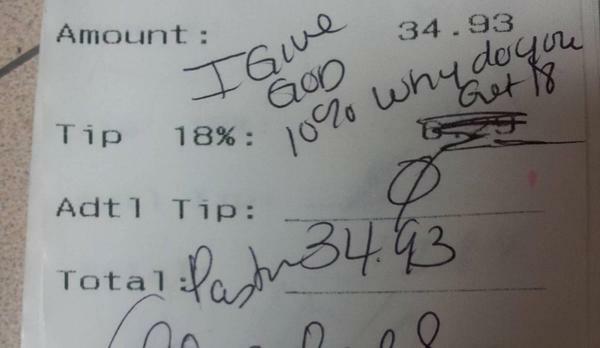 Even after all that, they can be fired for “embarrassing” a customer, who may directly make hideous mockery of his or her server, mayhap, on religious grounds. Back to the restaurant, one may understand someone who is upset with being coerced into paying an automatic gratuity. However, it is stupefying how any frustration can be directed towards a server. Waiters do not control gratuity settings; it’s done often in conjunction with state and city regulations. Stiffing up on tips is one thing, but to use God as reasoning for doing so is entirely misplaced, if not at all satanic. Because it deviates from the very purpose of charity which I hope the Hebrew Book, the Bible, which Christians use for worship, encourages. Is the obligation to tithe in some religious organizations separate from and extoled over the duty to be charitable, as Christian doctrine purports to inspire? Does this alleged ‘minister of the gospel’ whose note has become public believe that after tithing she has no other compulsion for the plight of the poor? The answer may be affirmative. Historically, a tithe is one-tenth part of earnings paid in kind, such as agricultural products, as a contribution to a religious organization or compulsory tax to a government, which in Hebrew times were the Temples. Today, tithes are normally voluntary and paid in cash, cheques, or stocks. Several European countries operate a formal process linked to the tax system allowing some Churches to access tithes whereas in most African countries, Churches keep every dime, and do not allow government to access the funds. This has led many Christians in Africa to dub Church coffers as Tight Funds, in the proverbial ‘tithe funds’ spirit in which anybody else but the clergy find it extremely difficult to access such moneys, even for charitable work. Although in Christianity, some interpretations of Hebrew teachings conclude that although tithing was practiced extensively in the Old Testament, it was never practiced or taught within the first-century Church. Instead, the New Testament books are seen as teaching the concept of “freewill offerings”, otherwise known as charitable contributions, as a means of supporting the Church: 1 Corinthians 16:2, 2 Corinthians 9:7. Also, some of the earliest groups sold everything they had and held the proceeds in common to be used for the furtherance of the Gospel: Acts 2:44-47, Acts 4:34-35. Much like today’s Jews enforce in their communities everywhere they go. More striking in Christian doctrine however is the Acts of 5:1-20, which contains the account of a man and wife (Ananias and Sapphira). They sold a piece of property and donated only part of the selling price to the church but claimed to have given the whole amount. Immediately they both fell down to the ground and died when they were confronted by the apostle Peter over their dishonesty. With this memory of fear and trepidation sweeping through Churches, over Christians, over ministers of the gospel and around pastors, it is only obvious that tithing, or giving to the Church has become either forced, coerced or indoctrinated. It has been elevated to monstrous heights even in Christian Teachings. So it must not at all be surprising why a minister of a Church of God would rather tithe than give freely to a poor hardworking waitress who is struggling to pay her bills. These are terrible times we live in. Such times depict a warping of the whole purpose of Religion, the way the Ancients thought it, the way our Kemet Ancestors founded it – to love thy neighbor as thyself!